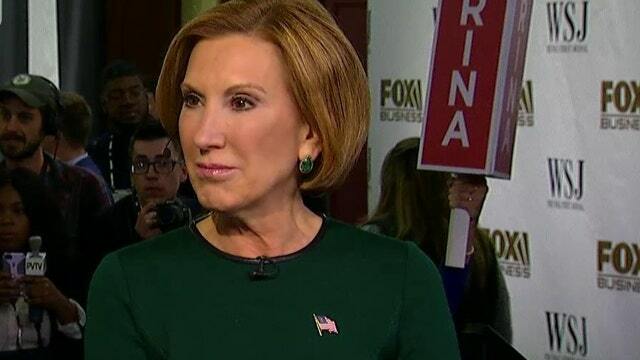 Presidential candidate Carly Fiorina on Vladimir Putin, the defense budget and interest rates. The College Republican National Committee (CRNC) along with G2 Analytics hosted a web-based focused group during the FOX Business Network and Wall Street Journal debate surveying both Republican and Independent Millennial voters. In data provided exclusively to FOXBusiness.com, the CRNC found that overall Millennials aged 18-29 resonated the most with Carly Fiorina during the debate, with 81% more likely to support her. The top five candidates that Millennials resonated with: Carly Fiorina, Kentucky Senator Rand Paul, Dr. Ben Carson, Florida Senator Marco Rubio and former Florida Governor Jeb Bush. Written responses in the poll cited Fiorina as articulating her positions and policies clearly and providing answers that were solutions oriented. "We see candidates succeed if they have specific policy solutions for the future" says Alex Smith, National Chairman of the CRNC. "Millennials are solutions oriented. They want to hear problem solvers talk about challenges of the day and how they’ll solve them." Smith also noted that Fiorina avoiding any on stage bickering or back-and-forth worked to her advantage in polling among Millennials. Fiorina has been praised in the past for her Millennial outreach, especially after a video she did with the popular Millennial news site BuzzFeed that highlighted workplace sexism. In a statement to FOXBusiness.com, Fiorina said: "The problems created by our bloated and corrupt government rest more heavily on the shoulders of Millennials--whether it&apos;s crushing student loan debt or an economy that isn&apos;t creating enough jobs for young people. I will restore more choice and competition to higher education, harness the power of technology to engage citizens in their government, and put America back in the leadership business." Smith added that messages speaking directly to the next generation, a strategy of Bush&apos;s, also resonate well with Millennials. And for GOP candidates looking to pick up votes from Millennials, they shouldn’t ignore their performance in the debate as the CRNC concluded that the majority of those surveyed said a debate performance was “influential” in helping determine who they support. But of the likely Republican and Independent Millennial voters, the CRNC report found that the majority are still undetermined as to who they would vote for in the primary, with 57% of Millennials saying that their minds are not made up on a candidate. "This speaks to the great diversity and breadth of candidates that we have" says Smith.